The photographs in this article are from an S2, however the calipers and techniques are identical to an S1. Thanks to Richard Gilmour for the photographs. 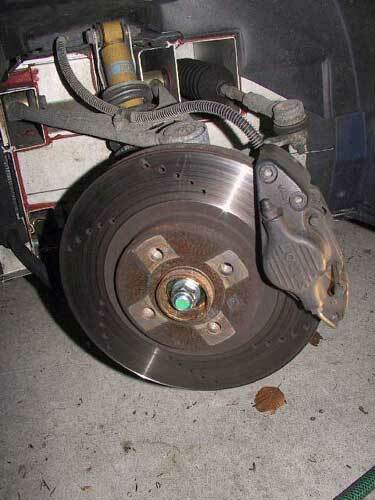 WARNING : Unless you are confident you know what you are doing, have the correct tools, and understand the implications of making a mistake don't work on the braking system of your car. 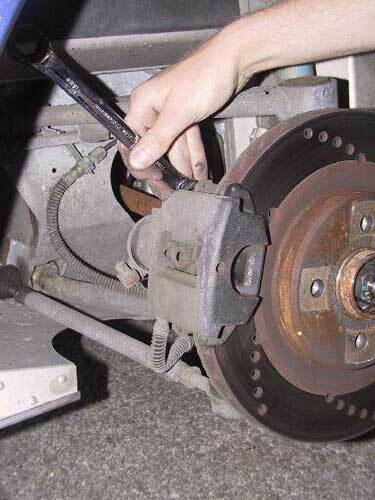 No Liability can be accepted should you make a mistake whilst working on your brake system. 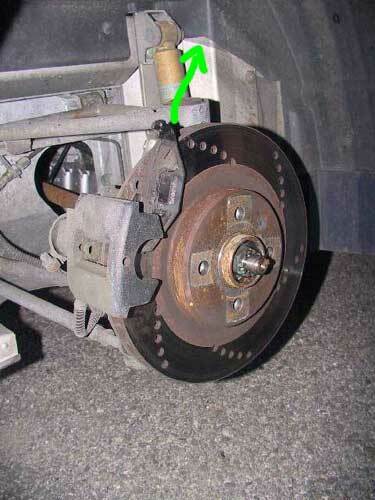 Jack up the side of the car using the central jacking point, having first loosened the wheel nuts and turn the steering to ease access to the caliper, remove the wheel. Ensure your safety by making sure the car cannot fall and that you are not relying on a hydraulic jack to hold the weight of the car. withdraw the pad retaining pins (B in the picure below) from the caliper, be carefull to hold onto the pad anti-rattle spring (and note it's orientation) otherwise it will spring off and disappear ;-). The caliper pistons must now be pushed into the caliper body, there are two pistons (the inner one marked B in the picture above). It should be possible to push the pistons into the caliper by hard finger pressure alone, however this takes some grunt and persistence. It may be necessary to improvise something to push the pistons but you must be very carefull to push the piston squarely into the piston bore otherwise you can damage the piston or bore or both. When fully pushed in the pistons will be flush with the caliper inner face. Insert the new pads in the same orientation as the old pads, replace the pad retaining pins and R clips and replace the wheel. That sounded fast, but re-assembly is the simple reversal of disassembly at this point, if you are all done make sure to close the brake fluid reservoir. 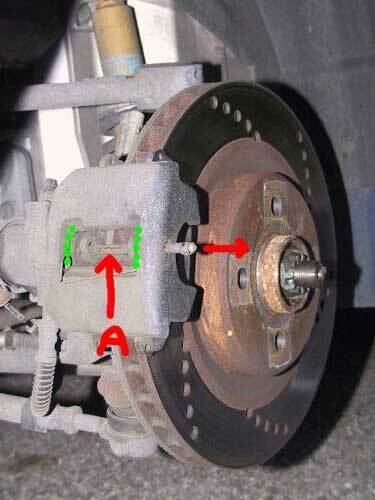 Some points of note, You MUST pump the brake pedal until it is firm BEFORE moving the car, this allows the caliper pistons to self adjust to the correct position with the new pads. Carefully smearing coopergrease on the piston facing side of the pad (NOT the surface touching the disk) can help stop squealing. However this is one of those religious debates which some people agree with and some violently disagree with, whatever works for you is fine, I always use coppergrease and my brakes never squeal. DOUBLE CHECK everything, TWICE, the brakes are very simple, but also absolutely critical, your and others lives depend on them, if you are unsure about what you are doing, leave it to a specialist. Better broke than dead. Jack up the side of the car using the central jacking point, having first loosened the wheel nuts and remove the wheel. You must ensure the handbrake is off, so alternative measures must be taken to prevent the car from moving whilst jacked. Note the positions of the pad anti-rattle springs, there are two of them fitted (the green dots on the picture above show their locations), Remove the pad retaining pin (A in the picture above) from the caiper by using an appropriately sized punch to push it ou of the caliper in the direction shown. Make sure the ani-rattle springs don't disappear into hyperspace when you remove the retaining pin. Remove the outer pad in the direction shown above, it may be necessary to use a light punch to move the pad initially. 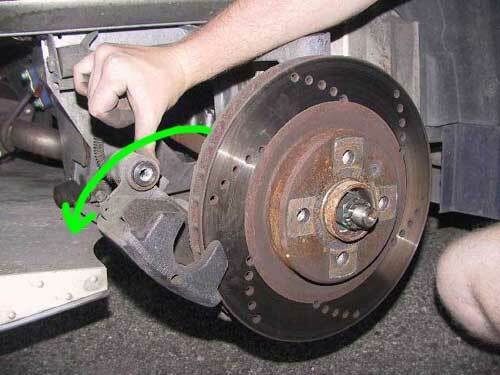 Rotate the caliper towards the rear of the car after removing the inner pad to gain access to the single piston. 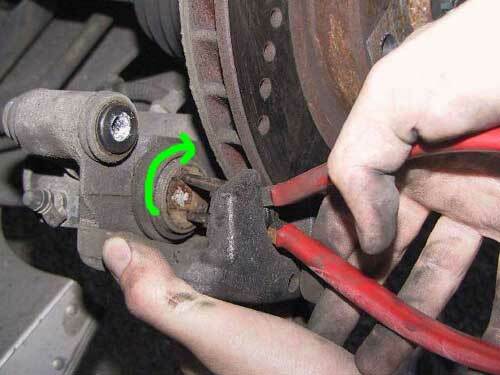 Be carefull not to damage the handbrake cable at this point, so not force the caliper. 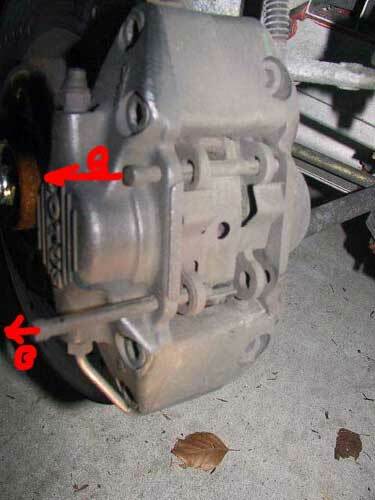 To push the piston back into the caliper you must turn it as it is being pushed, if you do not do this the piston will not push back into the caliper. 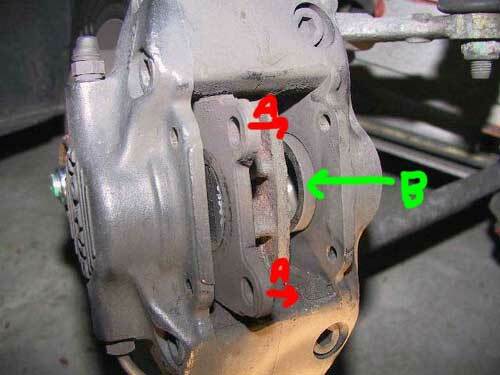 Again the piston will be flush with the caliper inner face when it is fully retracted. Be Carefull not to damage the piston seals if you use long nosed pliers as shown above as they can easily slip and cut the seal. You may wish to buy a proper piston wind-back tool for this job if you are not familiar. 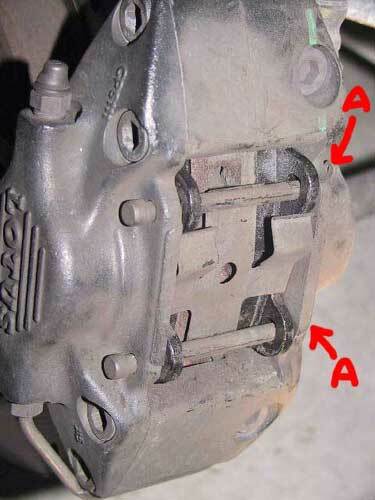 Some points of note, You MUST pump the brake pedal until it is firm BEFORE moving the car, this allows the caliper pistons to self adjust to the correct position with the new pads. Verify that the handbrake functions correctly.